Among the dozens of papal encyclicals, exhortations and documents that I have read and studied since around the time of my conversion to the Catholic Church in 2001, the release of one document is especially memorable. It was published in 2010 on the Feast of St. Jerome, the great lover and translator of the Bible into Latin. I was living at the North American College in Rome, just about a five-minute walk from St. Peter’s Basilica and the Vatican. I was enrolled in an English speaking seminar on the introductory topics of theology, which I especially enjoyed because it was my only class in English—all the others were lectures in Italian! At the time I was still clumsily growing in my Italian comprehension, though I must say after five years it became second nature. Earlier in the week I remembered hearing that the papal document would be coming out on September 30 and I was very excited to know that I would simply be able to walk to the Vatican book store and pick up a copy. I did just that, not even stopping by my favorite spot for a gelato on the way! I prayerfully devoured the lengthy Post-Synodal Apostolic Exhortation written by Pope Benedict XVI, which was called Verbum Domini with the subtitle, “ON THE WORD OF GOD IN THE LIFE AND MISSION OF THE CHURCH”. I remember how appreciative I was for having been able to read and reflect on the meaning of the document so close to where it had been written and given to the Church. It was a unique moment when I came to appreciate in a new way the splendid mind and heart of Pope Benedict that had written so eloquently on the centrality of the word of God in the life and mission of the Church. Reading the document fueled my desire to dive deeply into my biblical studies and to ponder on the word of God each day with the aim of becoming a preacher and minister of the word. Around the time of the publication of Verbum Domini, I was solemnly instituted as a Lector, one of the formerly so-called ‘Minor Orders’ which was received along to the path of priesthood. I can’t say that every papal document I’ve ever read was equally interesting or profound in its impact on me, but this one really was a fountainhead moment along the path of my lifelong growth to know and love the sacred scriptures. All of our readings today speak in some way about the scriptures as a gift. Very directly, the First Reading from Nehemiah 8 and the Gospel from Luke 1 are readings about readings, as they each portray the liturgical proclamation of the word of God in the assembly in a way that anticipates and foreshadows the reading of the Scriptures at Mass. What we do as Catholics is in perfect continuity with our Jewish forbearers, but in a unique way the Scriptures (even the Old Testament) become most fully themselves in the context of the Mass where they are read and heard with Christian and Eucharistic faith. What Jesus says is true each time the Scriptures are read at Mass: “Today this Scripture passage is fulfilled in your hearing”. As Catholics we sometimes lose sight of the importance of the Bible. We don’t often get up close and personal with it. We don’t often cradle it in our arms and open it up. We tend to be okay listening to readings at Mass, although we sometimes wonder what they mean and how they are relevant. We are often content not to have a very full context of where the readings come from in the Bible or how they fit into the overall arc of Salvation History. We happily sit back and wait for the preacher to make some sense of the readings for us, without welcoming them and even wrestling with them on our own in advance of hearing them at Mass. I think this weekend’s Mass readings drive home the very deep point that the Scriptures are one of the greatest of gifts that the Lord has entrusted us with; He has spoken everything to us in His Word; He desires that we enter into relationship with that Word and receive it with reverence and an eagerness to understand its meaning and relevance for our lives. After all, as Psalm 119:105 says so beautifully and simply: “Your word is a lamp for my feet, a light for my path”. The invitation is not just to dabble in the Bible out of curiosity but to be immersed in it, to consciously seek to be led by it and have all our activities inspired by it. Permit me one quotation from Benedict XVI’s Apostolic Exhortation, Verbum Domini, which by the way is available in a full PDF text for free on the Vatican website. Just google “Verbum Domini” and you will find it. There is great need, says, Pope Benedict, for a “‘biblical apostolate’, not alongside other forms of pastoral work [in a parish], but as a means of letting the Bible inspire all pastoral work. This does not mean adding a meeting here or there in parishes or dioceses, but rather of examining the ordinary activities of Christian communities, in parishes, associations and movements, to see if they are truly concerned with fostering a personal encounter with Christ, who gives himself to us in his word. Since [as St. Jerome famously reminds us] “ignorance of the Scriptures is ignorance of Christ” making the Bible the inspiration of every ordinary and extraordinary pastoral outreach will lead to a greater awareness of the person of Christ, who reveals the Father and is the fullness of divine revelation (emphasis added). The bible is not an ‘easy’ book; it can be heavy lifting, but it truly is the gift of God, within which are “hidden all the treasures of wisdom and knowledge” (Colossians 2:3). Realize as you hear the Gospel today, Christ is not only proclaiming the word from the scroll, but He is the Word that is proclaimed. 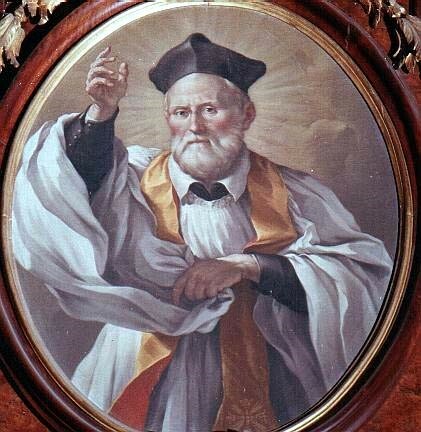 Understanding the centrality of the Word in the life of the believer and the mission of the Church was one of the marks of the priesthood of St. Philip Neri who quite literally re-evangelized sixteenth century Rome through setting hearts on fire with a love of the Scriptures. Fr. Hagan, Fr. Jaspers and I look to St. Philip as a patron of our community life and our hopes for the eventual formation of an Oratory under his patronage with a couple of other brother priests. In preaching and through opportunities to study and pray with the Scriptures we will steadily look for ways to keep the Scriptures at the heart of what we do and animate the spiritual renewal we hope for in our parish and neighborhood. Perhaps this is an obvious occasion to invite any who may be interested in joining the ranks of our Lectors for weekend or weekday Masses to reach out to Jordan in the parish office to inquire about how to get involved. Several weeks ago we hosted an Advent Lector training and reflection with positive feedback. There continues to be need for additional lectors at all of our Masses. Of course, there are great ways to delve into the scriptures on www.Formed.org using our parish code PBGWTD. Try to do something concrete to bring the Word into a more central place in your life.